Hello Friends, its Monday and I am wondering where the weekend went. I hope you had a great weekend and was able to get some crafty time. 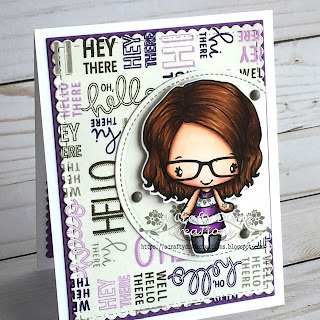 Today I am sharing a card using The Greeting Farm You're Spectacular along with Concord and 9th Oh, Hello turnabout stamp. I've had both of the stamps laying on my desk for quit some time and it was time to use them. I stamped the image out on hammermill digital 100 lb paper and used copics to color her up. I used the coordinating die to cut her out. 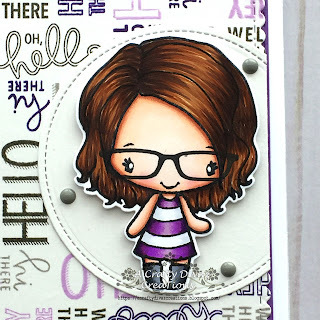 I then used the concord and 9th Oh Hello turnabout stamp to create my own pattern paper. I love this stamp set, so many things you can do with this set. I used a stitched scalloped rectangle and cut out the paper and placed it on the card. I then used a stitched circle from lawn fawn to layer behind the image. I finished the card off with some enamel dots. I love the way this card turned out. 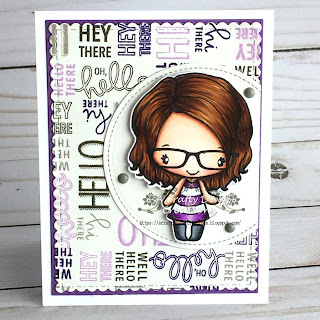 Super cute to give to a friend just to say Hello. Well that's all I have for you today. Thanks for stopping by, we will chat soon!